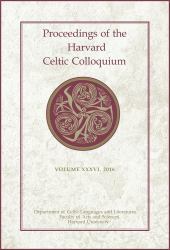 This volume of the Proceedings of the Harvard Celtic Colloquium offers a wide range of articles on topics across the field of Celtic Studies. It includes the 2016 J. V. Kelleher Lecture delivered by Jerry Hunter, professor of Welsh at Bangor University, Wales, entitled "The Red Sword, the Sickle and the Author's Revenge: Welsh Literature and Conflict in the Seventeenth Century." The articles from other presentations at the Colloquium focus upon language and literary studies from a broad variety of time periods and linguistic areas, including Irish, Welsh, Scots-Gaelic, with some reference to archaic or smaller regional Celtic languages. In addition to linguistic and literary topics, the volume includes some articles on the folkloric and religious culture of Celtic culture and society.